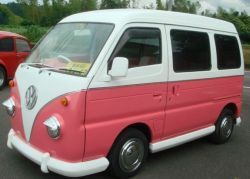 Subaru Samba For Sale UK registered direct from Japan, Algys Autos can supply you any model you wish fully UK registered. 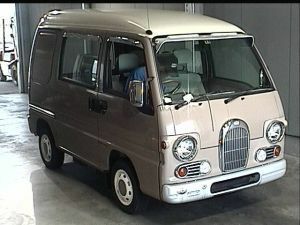 Absolutely unique Subaru Sambar, cute and very attractive tiny people carriers with 660cc petrol engine. The sambar was manufactured from 1961 until the present day and whilst it has various guises and model variants the general overall size of this tiny vehicle has remained constant. One thing is for sure though, they are sure to turn heads and create a wide grin wherever they go! They can be used seats-down as a van or in normal mode as a mini people carrier for 4 persons, very low tax and insurance and of course very economical on fuel. Produced in either Auto or Manual, 2 or 4 wheel drive. Aircon, PAS, Glass-roof, Electric windows and locking etc. Some models are even Supercharged! Fantastic advertising feature or simply for everyday fun! They are also even available as panel vans or commercial pick-ups! 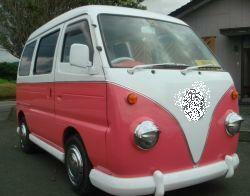 Supplied Complete with 12 months mot, 12 months tax and fully UK registered. The vehicles are most sought-after as the simple people carrier or in the ‘Classic Edition’ with unusual frontage and 1950’s retro looks. 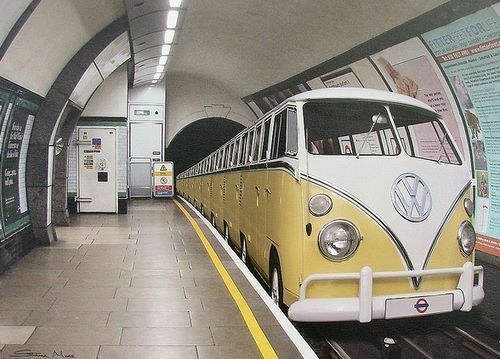 Some enthusiasts have even recognised their similarity to a vintage retro VW and customised them. See even mentioned in Wikipedia. Whichever model you choose they are all totally unique and they can be further customised by us to your requirements. Interiors can be colour coordinated and renewed. Available to exact specification via the Import Scheme …Prices from only £3495… Save £1000’s on prices and import via our unique Import Scheme. Want to Know more then email us here If it’s for an advertising or work feature you will probably want to stay with the ‘basic edition at about £3500 – £3995 OTR UK. If however this is for your pride and joy fashion accessory then you will want to consider our Deluxe versions; fully customised….and I mean fully customised. See below some of the Subaru Samba models that are available for sale fully UK registered and can be seen in and around Japan. Some of these Subaru Samba models have been customised* by foreign Companies and enthusiasts to add an extra twist to the car and an extra smile. The Samba was made available as a panelvan, small truck, pick-up and people carrier.Whatever Samba model you choose it is one thing for sure they are huge ‘Head Turners’ with great quality and features..Sure to bring a smile to anyone’s face! Subaru Samba For Sale. 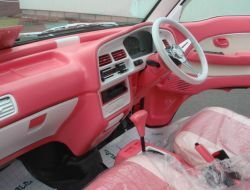 Now if you want to be even more adventurous…have the interior of your Subaru Samba FULLY customised by Algys Autos Ltd! A massive step-up from the standard mini model, these babes are totally customised. Prices are naturally higher but look at them!! These fully customised babes are just a little more than other traders are selling totally standard models. Check them out for yourself, prices from £6995. Girls, Now come on….wanna be the talk and envy of the town? Dare to be wild an’ Very Wicked! Get a Barbie Pink….Live a Little!! Please note: The majority of these Subaru Samba for sale are 660 cc engines and are very small vehicles. Whilst ideal for promotional use and tremendous fun for everyday use, they are NOT designed for fast speeds or prolonged Motorway driving etc. They are NOT camping converted nor can they be. Algys Autos are an Import Agency and NOT a Garage stockist. We do not stock these vehicles on a Garage Forecourt, we have them all available to us in Japan via our Garages and Dealerships and can Import ANY model you wish from Japan and supply UK Registered for you. We have the full infrastructure in place to locate, purchase, import and register your chosen Subaru Samba on your behalf. 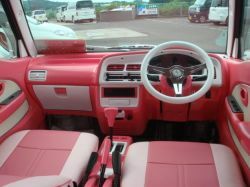 Some of the customised vehicles above have been customised by others in Japan and elsewhere. 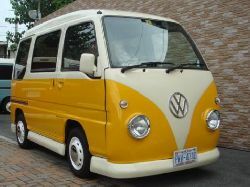 We are well aware that some Japanese Companies alter the external appearance of the cars to resemble and replicate a VW classic Campervan T2. Algys Autos have not carried out the external customisation or arranged for it to be undertaken on any of these vehicles. We are not responsible for badging as a VW and will NOT re-badge any vehicle to appear to be something that it is not. We will Import ANY vehicle you wish and locate it for you within Japan including Customised ones. 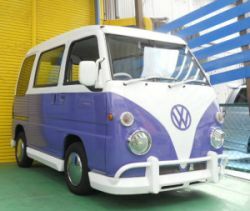 Take a look at this Crazy Customised Subaru Samba to look like a squashed VW Campervan! Remember, Algys Autos can import ANY Subaru Samba for sale in Japan and supply it to you fully UK Registered. Contact Algys Autos UK for full details, Email from here.